Williams gate works provides custom, high quality gates for all residential and commercial applications. There is a growing demand for gates made from “time-proven” Old World Joinery. I use only top quality lumber, and handcraft each gate individually to last a lifetime. I start with the finest quality wood. The three most common woods used to build my gates are clear heart Redwood, Western Red Cedar, and Mahogany. I also use reclaimed old growth Redwood for many of my gates as well. Each piece of lumber is hand-selected for proper grain pattern, which maximizes stability and strength. Moreover, the end grain of each piece of lumber is sealed with penetrating epoxy sealer, which prevents the wood from absorbing and releasing moisture too quickly, which can cause warping and issues with longevity. You will notice that most splitting and checking occurs mostly in the exposed end grain. All my gates are 2 1/4″ thick (rather than the more common and mass produced 1 1/2″). The pieces are joined with mortise and tenon joints. Each joint is made stronger and weatherproof with the use of marine grade epoxy. Ordinary carpenter glue — generally used in mass-produced gates — will not hold up to weather; it will become brittle and will soon fail. The use of this Old World Joinery — used for thousands of years by woodworkers worldwide — coupled with the state of the art adhesive results in a superior product which will hold together without sagging or failing. When combining mortise and tenon joinery with marine epoxy, the joint actually becomes stronger than the wood itself. Williams Gate Works offers a wide variety of high quality bronze hardware. While iron rusts, bronze is forever, evidenced by the bronze fittings found in the sunken ruins of Roman merchant ships. My gates are artistically designed for garden entries, driveways, pedestrian entries, and any other residential or commercial need. They are designed to enhance the beauty of your home and landscape and last a lifetime. We offer a large variety of styles, including several Asian designs. We can work with you on designing something unique to your home, as well as work with you, your designer, or architect on a new custom design. 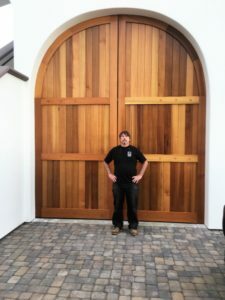 Williams Gate Works integrates creativity with time-proven woodworking techniques to produce unique gate designs with incomparable strength and durability. We work with numerous wood types including clear redwood, reclaimed old-growth redwood, clear cedar, western red cedar, bamboo and mahogany, with specialty design features in bronze and copper.